The Enterprise is going to the Academy so Picard can give a graduation speech. As they approach Picard is informed that Wesley's flight team had an acident while practising their graduation display. Picard tells Beverly that her son was injured, but is fine, although another boy died in the accident. 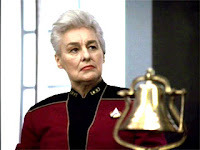 At the Academy the Admiral Superintendant reports on what they know so far and announces that she and a Vulcan officer will be conducting an investigation. After consulting with the dead boy's grieving father it has been decided graduation will be going ahead. Picard offers help, but Admiral Headteacher doesn't think she needs it. Picard and Beverly visit Wesley, who is still recuperating and doesn't want to talk about the accident. He's joined by his flight team's leader Nick Something, he is definitely not a young Tom Paris, despite being played by Robert Duncan McNeill who would later play Tom Paris in Voyager. Not-Tom Paris wants to talk to Wesley, who dismisses his mother and Captain Picard. Not-TP tells Wesley that everything will be fine if they all stick together, the ominous music suggests otherwise. 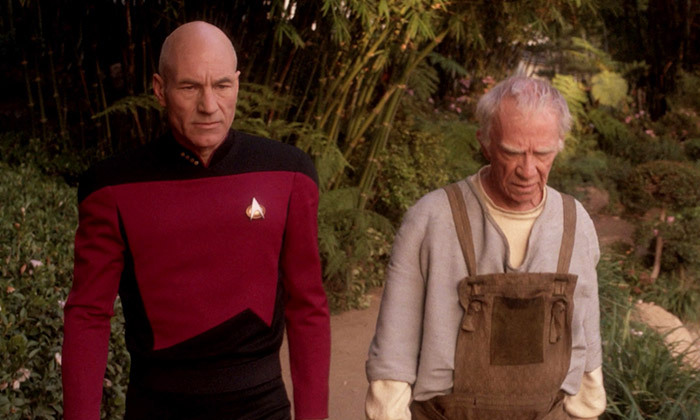 While walking the grounds Picard sees Boothby, groundkeeper and former mentor who he told Wesley to seek out in Final Mission. He seems to have the wisdom of Dumbledore and the employment histroy of Hagrid. His advice helped Picard back when he made a major mistake as a cadet (is this the episode theme, I wonder). Before the inquiry not-TP gives his squad a pep talk. He presents the flight plan and says the dead boy's ship collided with another. The navigator is questioned about deviating from the flight plan, Admiral Headtecher is pulling no punches. The Vulcan investigator questions the group and doesn't buy that no one saw what happened. Not-TP interjects to defend his team and explains how the dead boy was nervy and couldn't take it, the bereaved dad looks so, so sad. Not-TP earnestly talks about how he wanted to give his friend a chance. Admiral Headteacher is super angry about this. Wesley is troubled. Picard asks Data and Geordi to help Wesley by investigating, even though this isn't their remit and Wesley didn't ask for any help. Geordi even points out that they can't really contribute much. This feels like busy work, or an excuse to get Data and Geordi onscreen. Wesley and his team discuss the inquiry; Wes is angry that they scapegoated the dead boy and omitted information. Not-TP says whatever he can to convince them that maybe it was their dead friend's fault, and they need to protect themselves. He emotionally manipulates Wesley by invoking team loyalty, and all their future plans together, and that the dead boy wouldn't want them to risk all that. Later Wesley is found by the bereaved father, who returns a jumper and apologises that his son let them down and put them in danger. It is so sad! At the reconvened inquiry Wesley testifies, only a tiny bit of footage was recovered from his... space-plane? The Vulcan asks about the formation, Wesley lies as instructed by not-TP, even though the Vulcan is clearly building to something. A satellite caught a shot of them, and they aren't flying in the formation Welsy described, he refuses to comment further. Beverly shows she believes Wesley, and he gets worked up and begs that no one should try to help him. 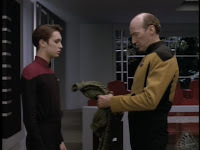 Picard goes to Boothby and asks about Wesley's flight team, Boothby says the other cadets look up to them and not-TP commands total loyalty. Data and Geordi report to Picard about the footage from Wesley's space-plane. The only odd thing is that Wesley opened a valve at a weird time, it's dangerous because it could cause fire (they say plasma, but I think that's like fire). Picard suddenly realises that they wanted fire. He summons Wesley to his office, and reveals that he's figured it out. They were practising a showy but super dangerous manoeuvre which creates a starburst pattern. It's been banned at the Academy for a century, but presumably not-TP wanted to graduate in a blaze of fire/plasma/glory and talked the others into it. 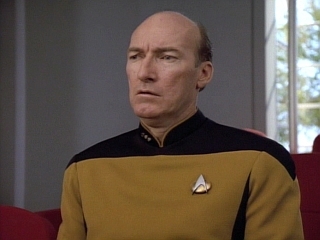 Wesley goes quiet, Picard is angry about the lie and describes how promising Wesley was on his first day onboard. This is also a kind of emotional maniupliation, but it's not self-serving. Picard expresses his disappointment and says if Wesley doesn't tell the truth then Picard will go to the Admiral. 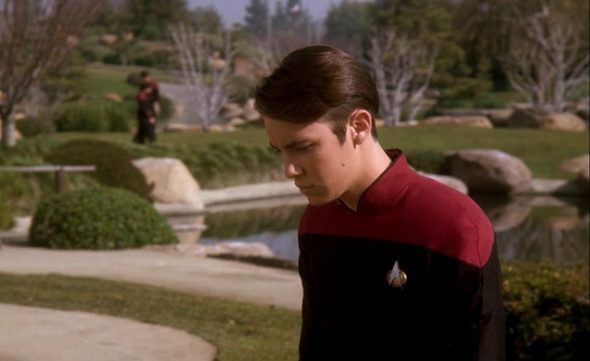 Wesley runs to not-TP (bad move) and tells him what Picard said. Not-TP stops worrying the moment he discovers Picard has no actual proof. He says they'll just claim Picard is lying, which is very stupid for two reasons: 1) Wesley Crusher is not going to go on the record and falsely accuse Captain Picard. 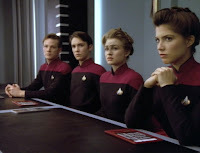 2) You are 4 cadets who are already under suspicion for being tight-lipped and he's the Captain of the Starfleet flagship whose only personal stake in this might be to protect Wesley; it's not a game of he-said we-said you want to get into. Not-TP dismisses Wesley's concerns and tells him he can't make decisions for the rest of the team. 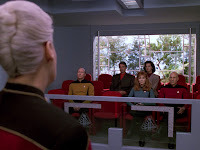 Wesley suggests they all come forward together, and not-TP makes a decision for the rest of the team by refusing and accusing Wesley of betrayal, then framing his own lies and pressurring as noble. Inquiry time again! Admiral Headteacher is disappointed by the suspicious lack of answers, she totally thinks they're lying, but has no proof. She's about to close investigation and dole out reprimands and flight bans, when Wes stands up and tells the truth. Beverly nods as he does. Wesley apologises to the greiving father and says it wasn't his son's fault. Not-TP has nothing to say, for once. 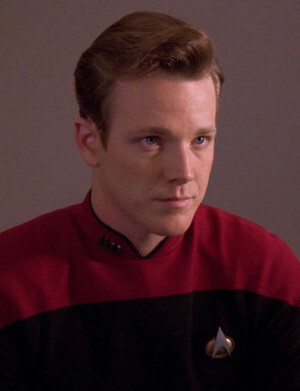 Robert Duncan McNeill, better known as Tom Paris in Star Trek: Voyager. The internet tells me the Voyager writers wanted someone with the same feel as Nick Locarno, and couldn't find anyone they liked better than McNeill. Theories abound about why the character was a different person. Picard is kinda Wesley's Achilles Heel here and his manipulative friend badly misjudges this. It's after Nick suggests lying about Picard's integrity that the scales fall from Wesley's eyes and he can see what's happening. I don't like the theories about hidden paternity (it's Not Cool to either Picard or Dr Crusher, and also people don't have to be blood relatives to have that kind of bond), but it's cool that Wesley has a mentor/father-figure who instills these values and holds him to account. I do wish that they'd use Beverly for that kind of thing more (see Doctor Doctor). Picard lying to protect Wesley might've been understandable, it's known that he's a family friend, but of course he wouldn't. Picard's offer to help is politely declined by the Admiral. I think we're used to seeing the Enterprise as impressive, a city-sized ship full of wonders. This is especially true when they're out in space and dealing with people who need help or who are less-technologically advanced. That doesn't hold here, San Francisco has been a city a lot longer than the Enterprise has existed, the Academcy is the main (only?) training institution for Starfleet. Geordi says the Academy labs are better than what the Enterprise has The only kit I can think of that the Acadmey wouldn't already have access to is Data, and that doesn't seem to be a factor here. Not sure why the Admiral agreed to it later, my guess is Picard pestered her. I find it a bit weird that Picard is told about Wesley's accident before Beverly, his mother. The Admiral says it's because Picard is a close family friend, but it's not like Beverly is far away or inaccessible, she's on the same ship, the message could be routed to her. I don't know whether this is a command thing, because he's Captain it's his responsiblity to break bad news. Or is it a personal thing? Admiral Brand kind of knows Picard, but presumably not Beverly. Did she think that the news would be better coming from a friend? Picard breaks the news of Wesley's accident to Beverly gently and with facts. She worries as any mother would, but because she's also a doctor she starts thinking through medical implications. Picard has to assure her several times that Wesley is fine. Later she offers Wesley help, because she has no reason to think he's lying, and is confused when he begs her not to help him. At the end when she nods I think that's her acknowleging that her son is doing the right-but-difficult thing, and presumably his previous behaviour makes sense now. Assuming Picard didn't let her know what was going on, it's not clear either way. As ever the show has no interest in exploring Beverly and Wesley's dynamic, or how they interact as mother and son. 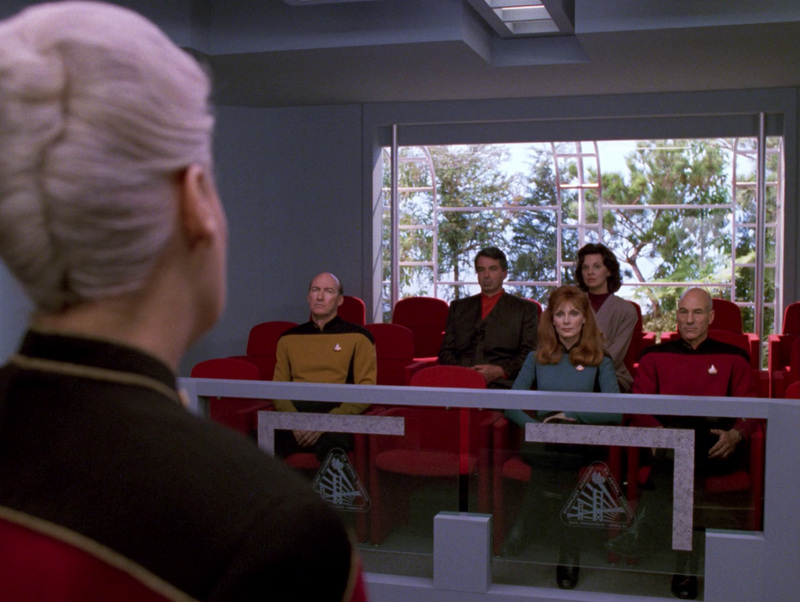 It's an ongoing disappointment to me that Beverly is constantly side-lined in favour of exploring Wesley's relationships with just about anyone else (Picard, the rest of the command staff, a couple of one-episode girls, this Academy jerk, that alien he's met twice). It's like someone decided that motherly love was basically part affection, part protective worry and a bit of being vaguely embarrassing, and then figured that'd do and no one thought to revisit it ever again. Not good enough. Except Admiral Superintendent Brand isn't. She's doing exactly what she needs to do and treating the whole thing with appropriate seriousness and professionalism. At the start of the episode Picard describes Brand as "a formidable women", which sounds negative in the same vein as bossy (i.e. something a man probably wouldn't get called for the same behaviour). We're primed to expect her to be hard, but this is a bad situation we see her in. Of course there has to be an investigation when a student dies, to do otherwise would be neglient (I'm looking at you, Hogwarts). She discussed cancelling graduation ceremonies with the bereaved father and she credits him for them continuing, which strikes me as a sensitive response. As does contacting Picard about Wesley's accident. The comment about life and duty continuing even after a tragic loss seems like it fits with the (sort of) military ethic of Starfleet. The inquiry is fair and transparent, it only feels like a trial to the viewer because we know people are guilty. When the students who were involved in the accident are suspiciously reticent Admiral Brand doesn't hide her understandable disapproval. She isn't going to pull punches when finding out the truth, but she also doesn't resort to scare tactics, like separating them and grilling each one. Before Wesley confesses she states that she's suspicious, but that isn't proof and so she will only punish them for provable errors. This is the most fair-minded and sensible Admiraling I've seen on this show! Maybe Admirals are fine in their own territory and it's just the ones that show up on the Enterprise that are trouble. Admiral Brand questions the girls on Wesley's team. It's in the context of an inquiry into a boy's death, so I'm not sure if it's Bechdel-Wallace passing, but Brand is questioning them about specific details relating to their roles on the flight team. This is only about 12 lines in the whole episode, which really isn't much. Cadet Joshua Albert died in a flight training exercise near Saturn while practising a banned manoeuvre. This happened before the episode started, so we don't see him, and normally I wouldn't mention his death, except that he left behind a grieving parent who may be the saddest person I've seen on this show. Commander Albert seems to be alone, called to the Academy to see the inquiry into his son's death. Does this mean there's no other parent? When he thinks his son's error risked others he's so apologetic. It breaks my heart a bit and I kinda judge Wesley for not telling the truth straight away. Wesley and Picard walk the grounds. Nicholas Locarno was expelled. Everyone was almost expelled, but Nick said that he forced them to do it, so his talk about protecting the team was true, but he still used it to manipulate. Wesley feels sad and he's been set back a year of study as a punishment (no mention of what happened to the girls), plus everyone knows what he did. I'm not sure if he'll get worse stick for the cover-up or for exposing it. Wesley thanks Picard, who says he just made sure Weskey listened to himself. This is what Boothby said he did for cadet Picard, so I guess that wraos up the episode theme on a sober note.